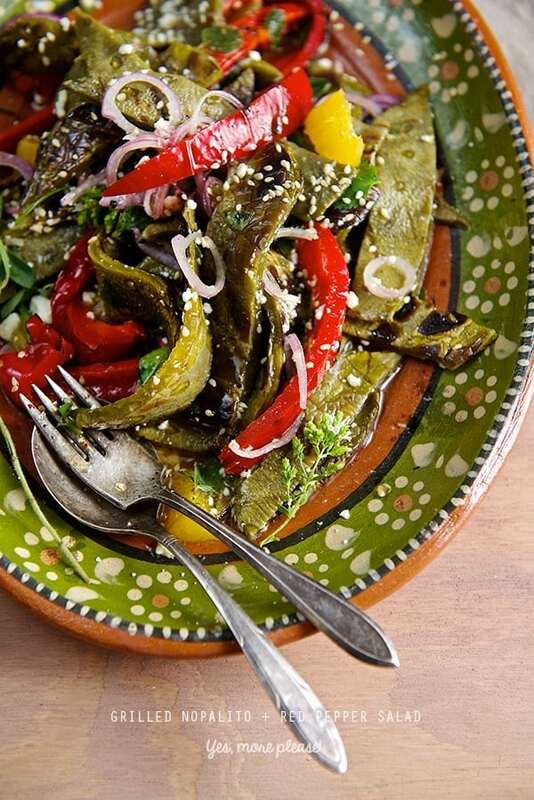 Grilled Nopalitos and Red Bell Pepper Salad ~Yes, more please! Have you ever had Nopalitos? Nopalitos are traditionally used in Mexican cuisine, they are part of the cactus family, there are more species than you want to know about. The word “Nopal” comes from the Nahuatl word meaning “pads” refers to the plant shape. They are a great source of Vitamin C, minerals like magnesium, manganese, calcium,and also a great source of fiber. Besids their delicious and nutritious qualities, recent research studies have shown a positive effect on glycemic index which could be useful and a great value to add to your diet when managing diabetes or to include on your weight loss diet. 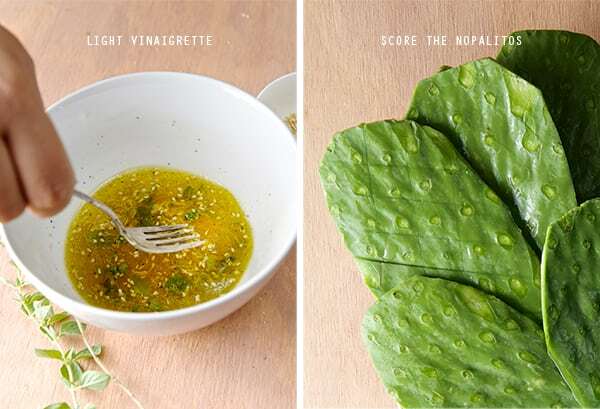 Anyhow, what you really need to know about Nopalitos and what I want to share with you is how delicious they are when prepared in a right simple manner. Nopalitos have a bad reputation among vegetables because of their slimy and viscous flesh. However there are different ways to prepare them and a couple of tricks to avoid the slimy culinary disaster. Like any other vegetable, Nopalitos can be boiled, steamed, sautéd, grilled or eaten raw, and there is a trick for each one of these cooking methods. Just to mention one of these tricks briefly, boiling nopalitos is the most common of all methods. When boiling Nopalitos, the trick to it is to add 4-6 tomatillo husks along with a piece of onion, a small bunch of cilantro and some sea salt in a pot of simmering water. The tomatillo husks will avoid the slimy matter. Simmer them in a pot over medium heat for about 15-20 minutes, until they change of color. Turn the heat down, and let them cool. Strain and rinse thoroughly. Combine the nopalitos with a good amount of Pico de Gallo salsa, toss and they are ready to serve. As you can see, with a little effort you can make the fastest salad of them all! My favorite way to eat nopalitos it’s grilled. The char gives them a great flavor, firm texture and reduces the slimy texture almost to zero when you grill them. Therefore it’s one of my favorite ways of cooking them. Nopalitos when grilled, make the best tasting salad. This is definitely one of my personal favorite Mexican dishes, so simple and full of great flavors. 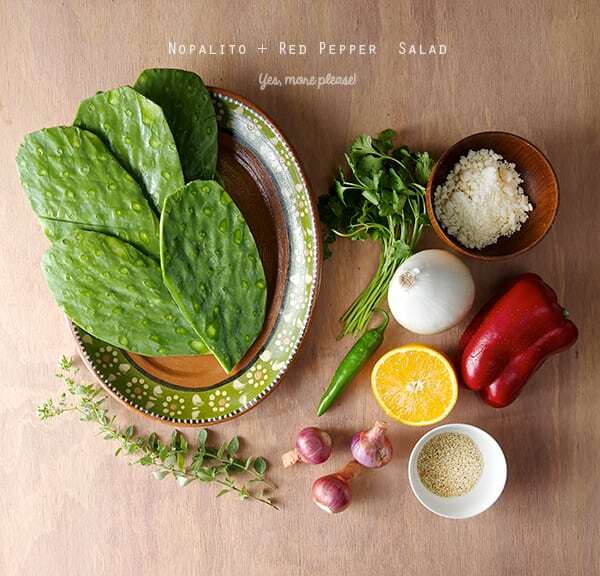 This Grilled Nopalitos and Red Bell Pepper Salad, combines simple ingredients and a crisp and tangy simple vinaigrette. As easy as it sounds it’s a great summer dish. This salad can be served as a side dish to accompany any grilled meat or fish. It can be made into vegetable medley tacos or as a vegetable complement over rice, quinoa, or whole black beans. I hope you enjoy the recipe and give yourself the opportunity to try something new. 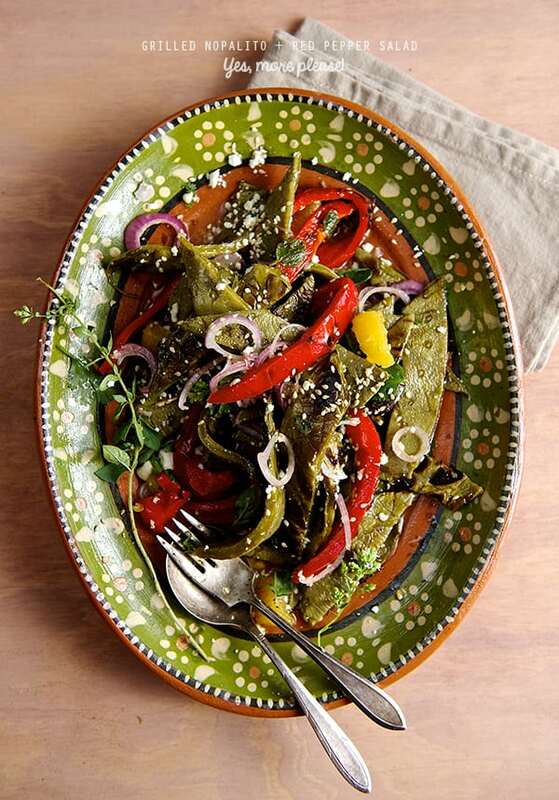 Nopalitos salad has been in Mexican cuisine for a long time and it is too delicious to be ignored. I would love to hear back from your culinary adventures. Remember to check our music pairings, if you are in need to shimmy while you grill…Enjoy! Grilled Nopalitos and Red Bell Pepper Salad. Serves 4… or 2 hungry Vegetarian Mexicans! 3 small shallots or 1 small white onion thinly sliced. 2 sprigs of fresh oregano or 1 teaspoon dry mexican oregano. ¼ cup Cotija cheese crumbled. *Nowadays it’s very easy to find fresh Nopalitos that have been cleaned and de-thorned. If you are lucky enough to have your very own nopalito cactus plant, gear up! Use thick leather gardener gloves, a pair of tongs, and a sharp fillet knife to shave the thorns off. Rinse and wash thoroughly. Now it’s ready to use! If you live here in Texas this type of Cactus Plant is very common to find in the prairie. Have a culinary adventure! Tip: when choosing wild nopalitos: you will want to pick the medium-small size, deep green, about 1/4 inch thin or less. They look tender and have plump edges with no dry spots.These are the best tasting nopalitos and tender when cooked. 1.Wash and with a pairing knife gently score your clean nopalitos. 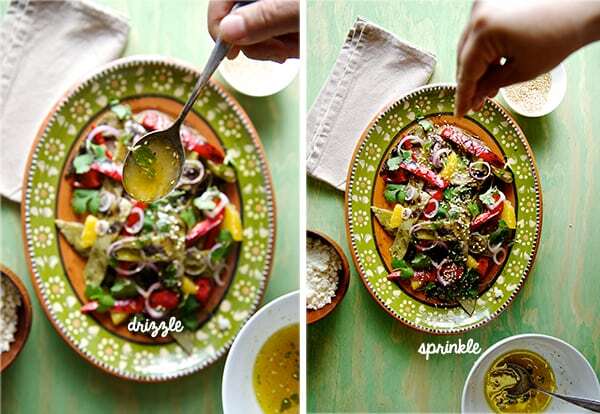 2.Prepare your vinaigrette by combining all the ingredients on a bowl and whisk. 3. Fire up your grill. 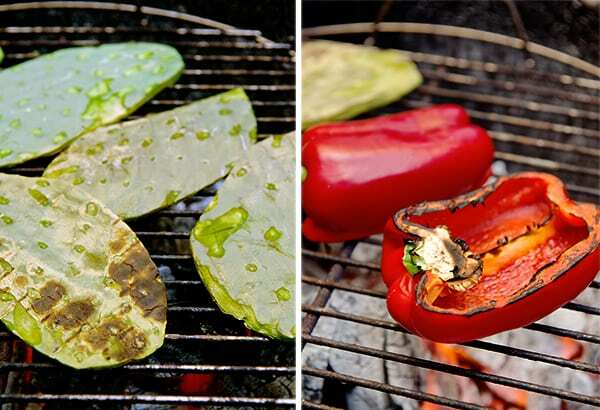 Grill Nopalitos and red bell pepper. Grill both sides until cooked and charred. 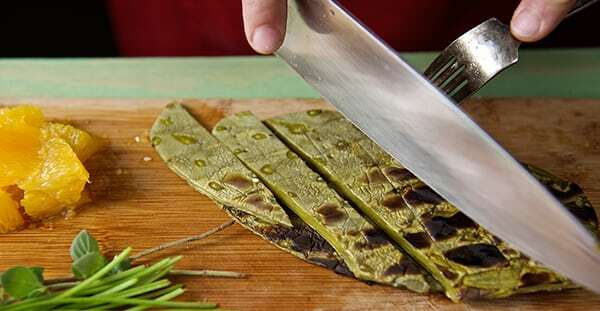 Nopalitos turn color from bright green to a olive green when cooked. Be sure to blister them. This will add so much flavor to the salad. 4. Slice your grilled Nopalitos into ¾” ribbon strips, slice your grilled bell peppers into a thinner strips. 5. On a platter toss all ingredients and drizzle the vinaigrette. Sprinkle some toasted sesame seeds and/or some Cotija cheese crumbled. Serve room temperature.